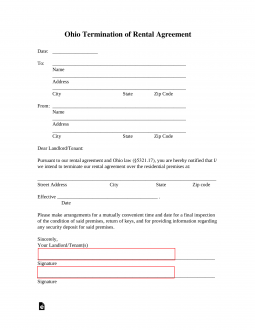 The Ohio Lease Termination Letter Form (30-Day Notice) is a legal document that allows either the landlord or tenant to make notice one to the other that it’s their intention to vacate the rental property (or have the property vacated) and terminate the rental agreement. This document provides 30 days notice to vacate. It will also provide an address for which, providing there is little more than normal wear and tear to the premises, where the security deposit (or a portion thereof) may be returned to the tenant.